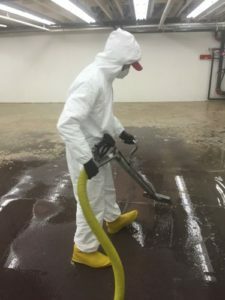 is categorized as highly dangerous water damage and removal emergency and cleanup needs to be handled by professionals who are equipped with the equipment and resources to disinfect and clean up the area properly. There are two different types of sewage treated sewage and untreated sewage. Treated sewage refers to sewage that passes through a water treatment plant ensuring all the harmful bacteria, pollutants, and contaminants are eliminated. It’s very rare that you would be in contact with treated sewage. The second type of sewage is untreated sewage referring to wastewater containing harmful contaminants, waterborne pathogens and bacteria which has not been through a water treatment plant. Please understand sewage emergencies should be taken seriously. In this article, you are going to learn the steps take if you are experiencing a sewage emergency in your home. The first and most important step for you to vacate the area immediately and give a professional company a call to access the situation and assist with the cleanup. Sewage spills are highly contaminated and can cause serious illnesses including Tetanus, Hepatitis A, and other gastrointestinal diseases from the exposed bacteria, fungi, parasites, and viruses. Please don’t panic or wait around call a 24-hour water damage restoration service right away. Notify your insurance company, water authority, your local health department of the emergency or your restoration contractor so they can walk you through the proper health and safety procedures. Now that you have vacated your family to safety and contacted the proper authorities it is advisable to call the water company and have the water to your house shut off unless the contaminated area is small and there’s no danger to you, you can turn them off yourself but, only if the power distribution and main water valve are safely above water! Open the doors and windows in the home to ventilate the area. Remove any dry and uncontaminated items. Add small amounts of bleach to standing water this will ensure some disinfection. It’s still advised you call and wait for a professional to arrive for the remainder of the cleanup. If you’re insistent on cleaning it up yourself to save some money here are some simple guidelines to follow before attempting to clean up. Put on personal protective clothing- rubber gloves, rubber boots, protective eyewear, and a facemask. Make sure skin is completely covered and doesn’t come in contact with any of the contaminated wastewater. Close the doors between the contaminated area and other rooms in the home to prevent any further spreading from tracking and debris in the infected damaged area. 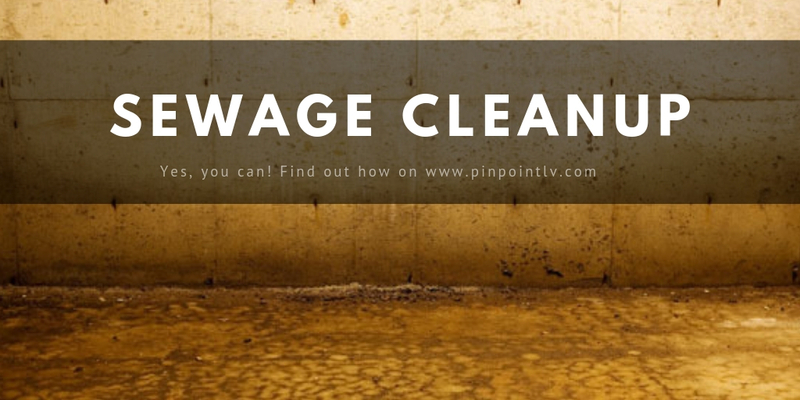 Remove the sewage water as soon as possible with proper removal equipment such as a pump, wet vac, and dry vac. Only if the spill is small otherwise please call a professional. Shovel any dirt, soil, and debris into heavy duty trash bags and dispose of them immediately. Remove all contaminated items in from the room to a room space with tiled or concrete floors for cleaning and sanitization or disposal. Remove any baseboards, wall paneling, carpeting, insulation, and flooring and dispose of them promptly and properly. Wash down all contaminated surfaces with hot water and bacterial disinfectant and follow up with a deep cleaning. Remove any excess water and let the area dry with windows open and dehumidifiers running for a minimum of 24-48hours after the emergency occurs. Get all electrical and plumbing systems checked and repaired if necessary. Take pictures of the sewage spill and water damaged items and structural damages before removing them or having them cleaned up (photographs serve as proof of the claim to your insurance company). Also keep all receipts for materials and replacements, as well as repair and cleaning services in your home. Inspect your property for mold and take effective precautionary measures to prevent the growth of mold. Remember, that increased levels of indoor moisture in the event of a sewage back up can cause mold to grow in the contaminated and damaged areas as well as throughout your home. If you find any mold visible use an EPA approved spray or call a professional to clean and remove it. Get more info here on how to clean up black water damage correctly Read more.. These steps will ensure that your home is properly sanitized and restored to a safe living condition. Again, professional services are a better bet than self-cleanup. Using a professional water damage, repair and restoration service will help you avoid hazards and dangers and your property returned to normal as soon as possible. Either way, a hasty and efficient intervention is safest and honestly, it may not cost you anything except your deductible as most insurances cover the costs of hiring professional help for these types of emergencies. When you hear prices like that, it makes you sick to your stomach. For some, that’s an impossible amount of money to pay for a service that frankly must be performed. “But what about insurance,” you ask. Most homeowners insurance policies do not cover sewer backups. YIKES!